For other uses, see Wombat (disambiguation). Wombats are short-legged, muscular quadrupedal marsupials that are native to Australia. They are about 1 m (40 in) in length with small, stubby tails. There are three extant species and they are all members of the family Vombatidae. They are adaptable and habitat tolerant, and are found in forested, mountainous, and heathland areas of south-eastern Australia, including Tasmania, as well as an isolated patch of about 300 ha (740 acres) in Epping Forest National Park in central Queensland. Though genetic studies of the Vombatidae have been undertaken, evolution of the family is not well understood. Wombats are estimated to have diverged from other Australian marsupials relatively early, as long as 40 million years ago, while some estimates place divergence at around 25 million years. :10– While some theories place wombats as miniaturised relatives of diprotodonts, such as the rhinoceros-sized Diprotodon, more recent studies place the Vombatiformes as having a distinct parallel evolution, hence their current classification as a separate family. Wombats dig extensive burrow systems with their rodent-like front teeth and powerful claws. One distinctive adaptation of wombats is their backward pouch. The advantage of a backward-facing pouch is that when digging, the wombat does not gather soil in its pouch over its young. Although mainly crepuscular and nocturnal, wombats may also venture out to feed on cool or overcast days. They are not commonly seen, but leave ample evidence of their passage, treating fences as minor inconveniences to be gone through or under, and leaving distinctive cubic feces. 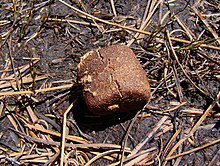 As wombats arrange these feces to mark territories and attract mates, it is believed that the cubic shape makes them more stackable and less likely to roll, which gives this shape a biological advantage. The method by which the wombat produces them is not well understood, but it is believed that the wombat intestine stretches preferentially at the walls. The adult wombat produces between 80 and 100, two-centimetre (0.8 in) pieces of feces in a single night, and four to eight pieces each bowel movement. Wombats are herbivores; their diets consist mostly of grasses, sedges, herbs, bark, and roots. Their incisor teeth somewhat resemble those of rodents (rats, mice, etc. ), being adapted for gnawing tough vegetation. Like many other herbivorous mammals, they have a large diastema between their incisors and the cheek teeth, which are relatively simple. The dental formula of wombats is 1.0.1.41.0.1.4 × 2 = 24. Wombats' fur can vary from a sandy colour to brown, or from grey to black. All three known extant species average around 1 metre (3 ft 3 in) in length and weigh between 20 and 35 kg (44 and 77 lb). Female wombats give birth to a single young in the spring, after a gestation period, which like all marsupials can vary, in the case of the wombat: 20–21 days. They have well-developed pouches, which the young leave after about six to seven months. Wombats are weaned after 15 months, and are sexually mature at 18 months. A group of wombats is known as a wisdom, a mob, or a colony. Wombats typically live up to 15 years in the wild, but can live past 20 and even 30 years in captivity. The longest-lived captive wombat lived to 34 years of age. Wombats have an extraordinarily slow metabolism, taking around eight to 14 days to complete digestion, which aids their survival in arid conditions. They generally move slowly. When threatened, however, they can reach up to 40 km/h (25 mph) and maintain that speed for up to 90 seconds. Wombats defend home territories centred on their burrows, and they react aggressively to intruders. The common wombat occupies a range of up to 23 ha (57 acres), while the hairy-nosed species have much smaller ranges, of no more than 4 ha (10 acres). Dingos and Tasmanian devils prey on wombats. Extinct predators were likely to have included Thylacoleo and possibly the thylacine. Their primary defence is their toughened rear hide, with most of the posterior made of cartilage. This, combined with its lack of a meaningful tail, makes it difficult for any predator that follows the wombat into its tunnel to bite and injure its target. When attacked, wombats dive into a nearby tunnel, using their rumps to block a pursuing attacker. A wombat may allow an intruder to force its head over the wombat's back, and then use its powerful legs to crush the skull of the predator against the roof of the tunnel, or drive it off with two-legged kicks, like those of a donkey. Wombats are generally quiet animals. Bare-nosed wombats can make a number of different sounds, more than the Hairy-nosed wombats. Wombats tend to be more vocal during mating season. When angered, they can make hissing sounds. Their call sounds somewhat like a pig's squeal. They can also make grunting noises, a low growl, a hoarse cough, and a clicking noise. The three extant species of wombat all are endemic to Australia and a few offshore islands. They are protected under Australian law. The name "wombat" comes from the now nearly-extinct Darug language spoken by the aboriginal Darug people, who originally inhabited the Sydney area. It was first recorded in January 1798, when John Price and James Wilson, a white man who had adopted aboriginal ways, visited the area of what is now Bargo, New South Wales. Price wrote: "We saw several sorts of dung of different animals, one of which Wilson called a Whom-batt, which is an animal about 20 inches high, with short legs and a thick body with a large head, round ears, and very small eyes; is very fat, and has much the appearance of a badger." Wombats were often called badgers by early settlers because of their size and habits. Because of this, localities such as Badger Creek, Victoria, and Badger Corner, Tasmania, were named after the wombat. The spelling went through many variants over the years, including "wambat", "whombat", "womat", "wombach", and "womback", possibly reflecting dialectal differences in the Darug language. After the ship Sydney Cove ran aground on Clarke Island in February 1797, the crew of the salvage ship, Francis, discovered wombats on the island. A live animal was taken back to Port Jackson. Matthew Flinders, who was travelling on board the Francis on its third and final salvage trip, also decided to take a wombat specimen from the island to Port Jackson. Governor John Hunter later sent the animal's corpse to Joseph Banks at the Literary and Philosophical Society to verify that it was a new species. The island was named Clarke Island after William Clark. Wombats were classified as vermin in 1906, and were subject of the introduction of a bounty in 1925.:103 This and the removal of a substantial amount of habitat have greatly reduced numbers and range of the wombat. Humans can receive puncture wounds from wombat claws, as well as bites. Startled wombats can also charge humans and bowl them over, with the attendant risks of broken bones from the fall. One naturalist, Harry Frauca, once received a bite 2 cm (0.8 in) deep into the flesh of his leg—through a rubber boot, trousers and thick woollen socks. A UK newspaper, The Independent, reported that on 6 April 2010, a 59-year-old man from rural Victoria state was mauled by a wombat (thought to have been angered by mange), causing a number of cuts and bite marks requiring hospital treatment. He resorted to killing it with an axe. Common wombats are considered by some farmers as a nuisance due primarily to their burrowing behaviour. "Fatso the Fat-Arsed Wombat" was the tongue-in-cheek "unofficial" mascot of the 2000 Sydney Olympics. Since 2005, an unofficial holiday called Wombat Day has been observed on 22 October. Wombat meat has been a source of bush food from the arrival of aboriginal Australians to the arrival of Europeans. Due to the protection of the species, wombat meat as food is no longer part of mainstream Australian cuisine, but wombat stew was once one of the few truly Australian dishes. In the 20th century, the more easily found rabbit meat was more commonly used (Rabbits are an invasive pest in Australia). The name of the dish is also used by a popular children's book and musical. Wombats have featured in Australian postage stamps and coins. The hairy-nosed wombats have featured mainly to highlight their elevated conservation status. The northern hairy-nosed wombat featured on an Australian 1974 20-cent stamp and also an Australian 1981 five-cent stamp. The common wombat has appeared on a 1987 37-cent stamp and an Australian 1996 95-cent stamp. The 2006 Australian Bush Babies stamp series features an AU$1.75-stamp of a baby common wombat, and the 2010 Rescue to Release series features a 60-cent stamp of a common wombat being treated by a veterinarian. Wombats are rarely seen on circulated Australian coins, an exception is a 50-cent coin which also shows a koala and lorikeet. The common wombat appeared on a 2005 commemorative $1 coin and the northern hairy-nosed wombat on a 1998 Australia Silver Proof $10 coin. Many places in Australia have been named after the wombat, including a large number of places where they are now locally extinct in the wild. References to the locally extinct common wombat can be found in parts of the Central Highlands of Victoria, for example the Wombat State Forest and Wombat Hill in Daylesford. Other significant places named after the wombat includes the town of Wombat, New South Wales. Numerous less significant Australian places, including hotels, are named after the animals. Prominent sculptures of wombats include in South Australia: "The Big Wombat" at Scotdesco Aboriginal Community (Tjilkaba) and Wudinna visitor information centre, Adelaide Zoo and Norwood; New South Wales: Wombat, New South Wales; Victoria: Daylesford, Trentham, Victoria and Kinglake; Tasmania: Steppes State Reserve. Wombats have also been a feature of Australian television. While wombats are not generally kept as pets, a notable depiction of a common wombat as a pet is Fatso from the Australian television show A Country Practice. The Brisbane television show Wombat was also named for the animals. Australian literature contains many references to the wombat. Examples are Mr. Walter Wombat from the adventures of Blinky Bill and one of the main antagonists in The Magic Pudding by Norman Lindsay. All species of wombats are protected in every state except for Victoria. The northern hairy-nosed wombat is an endangered species. The biggest threats the species faces are its small population size, predation by wild dogs, competition for food because of overgrazing by cattle and sheep, and disease. The only known wild populations of this species exist in two locations in Queensland, the Epping Forest National Park, and a smaller colony being established by translocating wombats to the Richard Underwood Nature Refuge at Yarran Downs. This second colony is being created through the Xstrata reintroduction project, which is being funded by Xstrata, a Swiss global mining company. The wombat population in the Epping Forest National Park has been increasing since a predator-proof fence was erected in the park. According to the latest census, taken in 2013, the park is home to 196 of these endangered wombats, with numbers at the two locations expected to have increased to 230 by late 2015. Despite its name, the common wombat is no longer common, and it has been officially a protected animal in New South Wales since 1970. However, in eastern Victoria, they are not protected, and they are considered by some to be pests, especially due to the damage they cause to rabbit-proof fences. WomSAT, a citizen science project, was established in 2016 to record sightings of wombats across the country. The website and mobile phone app can be used to log sightings of live or deceased wombats and wombat burrows. Since its establishment the project has recorded over 7,000 sightings across New South Wales, Victoria, Tasmania and South Australia. ^ a b Groves, C. P. (2005). "Order Diprotodontia". In Wilson, D. E.; Reeder, D. M. Mammal Species of the World: A Taxonomic and Geographic Reference (3rd ed.). Johns Hopkins University Press. pp. 43–44. ISBN 978-0-8018-8221-0. OCLC 62265494. ^ "Northern Hairy-nosed Wombat". Department of Sustainability, Environment, Water, Population and Communities. Australian Government. Retrieved 2 July 2011. ^ a b c Barbara Triggs (13 July 2009). Wombats. Csiro Publishing. ISBN 978-0-643-09986-9. ^ Penny, David; Nilsson, Maria A.; Churakov, Gennady; Sommer, Mirjam; Tran, Ngoc Van; Zemann, Anja; Brosius, Jürgen; Schmitz, Jürgen (2010). "Tracking Marsupial Evolution Using Archaic Genomic Retroposon Insertions". PLoS Biology. 8 (7): e1000436. doi:10.1371/journal.pbio.1000436. ISSN 1545-7885. PMC 2910653. PMID 20668664. ^ Sample, Ian (19 November 2018). "Scientists unravel secret of cube-shaped wombat faeces". The Guardian. Retrieved 19 November 2018. ^ Dvorsky, George (2018-11-18). "We Finally Know How Wombats Produce Their Distinctly Cube-Shaped Poop". Gizmodo. Archived from the original on 2018-11-19. Retrieved 2018-11-19. ^ "Mystery solved: this is how wombats do cube-shaped poo". Australian Geographic. 28 November 2018. ^ Watson, A (1999). "Vombatus ursinus". Animal Diversity Web. University of Michigan Museum of Zoology. Retrieved 13 August 2010. ^ Green, E; Myers, P (2006). 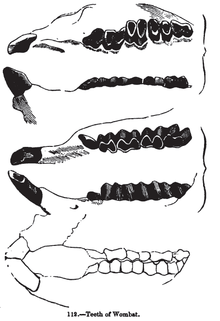 "Lasiorhinus latifrons". Animal Diversity Web. University of Michigan Museum of Zoology. Retrieved 13 August 2010. ^ a b c McIlroy, John (1984). Macdonald, D., ed. The Encyclopedia of Mammals. New York: Facts on File. pp. 876–877. ISBN 978-0-87196-871-5. ^ Britton, Ben. "Wombat". Animal Encounters. NatGeo Wild. ^ Common Wombat. National Geographic. Retrieved on 26 April 2017. ^ San Diego Zoo: Wombat. Animals.sandiegozoo.org. Retrieved on 26 April 2017. ^ a b Ballarat Wildlife Park: Common Wombat. Wildlifepark.com.au. Retrieved on 26 April 2017. ^ a b Humble, Gary (1 June 2006). "The Uncommon Wombat". Scribbly Gum. Australian Broadcasting Corporation. Retrieved 13 August 2010. ^ "Common Wombat". Department of Primary Industries, Parks, Water and Environment. Tasmanian Government. Retrieved 13 August 2010. ^ "Lasiorhinus krefftii – Northern Hairy-nosed Wombat, Yaminon". Department of the Environment, Water, Heritage and the Arts. Australian Government. 12 February 2010. Retrieved 13 August 2010. ^ Totaro, Paola (2 July 2003). "Rock art find makes Stonehenge seem recent". Sydney Morning Herald. ^ James Woodford (30 January 2012). The Secret Life of Wombats. Text Publishing Company. p. 7. ISBN 978-1-921834-90-5. ^ a b Butler, Susan (2009). The Dinkum Dictionary: The Origins of Australian Words. Text Publishing. p. 266. ISBN 978-1-921799-10-5. ^ Reed, Alexander Wyclif (1969). Place-names of New South Wales, their origins and meanings. Reed. p. 152. ^ "Common Wombat". Lady Wild Life. Retrieved 1 September 2008. ^ a b Wells, R.T. (1989). "Volume 1B Mammalia" (PDF). In Walton, D.W. Vombatidae. Richardson, B.J. AGPS Canberra/Department of the Environment, Water, Heritage and the Arts – Commonwealth of Australia. p. 4. ISBN 978-0-644-06056-1. Retrieved 30 December 2009. ^ Simpson, J. (16 January 2009). "The 'wombat' trail – David Nash". Transient Languages & Cultures. The University of Sydney. Retrieved 30 December 2009. ^ Nash, M. "Maritime Archaeology Monograph and Reports Series No.2 – Investigation of a Survivors Camp from the Sydney Cove Shipwreck." Master of Maritime Archaeology Thesis. Department of Archaeology, Flinders University, South Australia. 2004. Accessed 30 December 2009. ^ Moore-Robinson, J. (1911). A Record of Tasmanian nomenclature, with dates and origins (PDF). The Mercury Printing Office – Hobart, Tasmania. p. 28. Retrieved 30 December 2009. ^ Robinson, Georgina (7 April 2010). "Wombat combat: danger is their middle name". The Examiner. Retrieved 13 August 2010. ^ Underhill, David (1993). Australia's dangerous creatures. Sydney. p. 368. ISBN 978-0864380180. ^ "Wombat bites Australian bush fire survivor". BBC News Online. 6 April 2010. Retrieved 9 April 2010. ^ "Australian Man Mauled in Rare Attack". The Independent. 7 April 2010. Retrieved 7 April 2010. ^ Middleton, Amy (22 October 2009). "The day of the wombat". Australian Geographic. Archived from the original on 30 September 2013. Retrieved 13 August 2010. ^ Bishop, Rita. "Wombat Stew by Marcia K Vaughan: Teaching Notes" (PDF). ^ "Ten Dollar". Blue Sheet Coin Values. Retrieved 19 March 2017. ^ a b c d e f "Northern hairy-nosed wombat, Lasorhinus krefftii". Queensland Government. 23 October 2015. Retrieved 19 March 2017. ^ Willis, Paul (7 March 2003). "Northern Hairy Nosed Wombat". ABC Television, Catalyst. Retrieved 8 February 2012. ^ Todd Woody (12 March 2009). "Wombat Love". Time. Retrieved 22 April 2011. ^ "Wombats". New South Wales Government. ^ "Wombat, Vombatus ursinus". Parks & Wildlife Service, Tasmania. 21 May 2012. Archived from the original on 27 April 2013. Retrieved 23 January 2015. The Secret World of Wombats, Jackie French with illustrations by Bruce Whatley, Harper Collins Publishers, 2005, ISBN 0-207-20031-9. Christmas Wombat, Jackie French with illustrations by Bruce Whatley, Clarion Books, 2012, ISBN 978-0547868721. Look up wombat in Wiktionary, the free dictionary.